You are here : New York City Travel Tips » When? » December » What to do for Christmas and New Year’s Eve in New York? If you don’t know what to during Christmas and New Year's eve in New York, I have some great advices and tips for you. ├ What to do on Christmas day and on the 26th of December? ├ Active New Year’s Eve in New York!!! ├ What about the kids? ├ Go for a swim during or before the new year!!! ├ What to do on New Year’s Eve? └ What to do on January 1st on New Year’s Day? In New York, the celebrations begin early with the famous Santa part of Macy’s Thanksgiving Parade, a New York tradition for Thanksgiving on Thursday, November 24, 2018. During the holidays, all department stores offer amazing holidays decorations including: Bloomingdale’s, Bergdorf Goodman, Barney’s, Saks Fifth Avenue, Lord & Taylor, Macy’s among others. 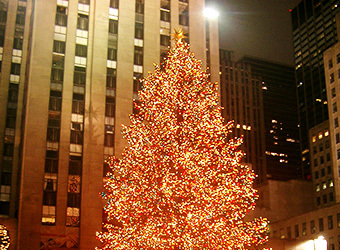 During Christmas in New York, stop at the Rockefeller Center Christmas tree, especially when it’s lit up at night. For Christmas 2018, the lightning ceremony for the Christmas tree will take place at Rockefeller Center on November 28 from 7 to 9 pm. It will stay lit up until January 7, 2019. You can also follow the journey of the Rockefeller Christmas tree along with its decorations and lightning on this website. Once you’ve seen the Christmas tree and snapped some photos, put your ice skates shoes on and enjoy skating under the tree, just like millions of people you probably have seen in movies and on TV shows, and now this is your chance to experience that J. In addition, there’s nothing more romantic than ice skating with your better half under the Rockefeller tree in New York. So, if you’re traveling during the Christmas holidays then enjoy it to the fullest!!! Here are some great tips regarding the most famous and recognized Christmas markets in New York. I highly recommend visiting some of them, Christmas time in New York is truly a magical time so don’t hesitate to brave the cold and discover NY’s Christmas Markets!! Enjoy the special Christmas spirit that you can only find in New York. You’ll see that in every stores, you’ll hear Christmas songs. In the streets, many people are chanting Christmas Carols just like in the movies. The Salvation Army, as a tradition, rings a bell in the streets of New York to raise some money during the holidays. What to do on Christmas day and on the 26th of December? On Christmas day, most stores and museums are closed. I advise you to take advantage of the outdoors and discover some of New York’s neighborhoods and boroughs, especially Central Park. Along with Thanksgiving, Christmas is the only holiday where NYC is slowing down, even finding a restaurant might be a difficult task. I know that Petit poulet is having a special menu and it's delicious! - Radio City Christmas Spectacular – Shows during the day. - Empire State Building – Open from 11am to midnight. - Top of the Rock – Open from 8am to 11pm. - The Rink at Rockefeller Center – Open from 8:30am and midnight. - The Pond at Bryant Park – Open from 8am to 10pm. - Wollman Rink in Central Park – Open from 10am and 11pm. - Central Park Carousel –Open from 10am and 6pm. - Jewish Children’s Museum – Open from 10am to 7pm. - Jewish Museum –Open from 11am to 4.30pm. - Museum of Jewish Heritage – Open from 10am to 5.45pm. - Madame Tussauds Wax Museum – Open from 9am to 10pm. If snow has fallen on Central Park, then prepare to be blown away and make sure to take some photos on that special day. Keep in mind that in this time of year, New York tends to be very cold. Make sure to wear warm and comfortable clothing. My special trick is to wear layers, leggings or tights, hats and gloves are a must if you want to enjoy spending time outdoors!! For sports fans, Christmas time is no break for the NBA, NHL or NFL. It’s good time to reserve your seats and watch a good game. You know that I love going to rooftops in New York City. They are a great option if you want to have a drink, most of them are covered during winter time. Active New Year’s Eve in New York!!! Here’s a great, affordable and original tip to start the year 2019 with a program including: jogging, dancing, a contest and a costume show. During the month of December, kids are invited to learn about celebrations around the world in Staten Island at the Children’s Museum (www.sichildrensmuseum.org) about cuisine and decoration. New York zoos hold special holiday events as well; the Bronx Zoo offers winter shows in its special program “Wild Winterland” (ice sculpture, Christmas carols and more).On weekends Queens’s zoo offers a special Christmas menu to its residents under the amused watch of the crowd. - Just like every year, the The Nutcracker , will be held at Lincoln Center by the New York City Ballet. - The traditional Christmas Rockettes will perform at Radio City Hall, a real treat for the entire family, shows starts from November to January 2, 2107. - Dyker Heights, a Brooklyn neighborhood close to Bay Ridge between 83rd and 86th streets and 11th and 13th avenues, will be lit up in the spirit of Christmas just like every year. It’s a great sight!! I strongly recommend it since this Christmas tradition in Dyker Heights draws more than 100.000 visitors each year!! - There are also special concerts and events in New York City, Brooklyn... Most of them are on the calendar of events. Go for a swim during or before the new year!!! 2 unusual events are happening during winter time, but beware, this is only for the braves and is an open call to all swimmers out there who want to take a chance to swim in the frozen water of the Atlantic. The first one is a ritual that started in 1903 on New Year’s Day in the south of Brooklyn: it’s the Coney Island Polar Bear Club. The second one is taking place on December 2 in Staten Island: it’s the Polar Plunge. In New York, just like every year, the celebration is everywhere but it’s in Times Square that everything is happening!!! You have to arrive early if you to score a spot to see everything but I do not recommend bringing small children since it’s extremely crowded and cold. Anyhow, don’t miss the fireworks in Times Square!!! If you manage to make it, I’m sure that must a fantastic experience (I say that since I never had the courage to brave the cold and stand long hours until the bell drops!!). What to do on January 1st on New Year’s Day? Enjoy Central Park on January 1st 2019!!! 2 responses to the post : " What to do for Christmas and New Year’s Eve in New York? " That swim looks like fun but I don't think I'm brave enough for it! Great list of things to do!